Architect: Fusco, Shaffer & Pappas, Inc. Despite substantially increasing the size of its office space, the company’s energy costs have significantly decreased. 966 Livernois performs 7 times better than Department of Energy benchmarks. When O’Brien Construction founder, Eddie O’Brien, began the firm back in 1962, he probably never imagined that his company would someday construct and occupy an environmentally state-of-the-art headquarters and become an industry leader in green practices. 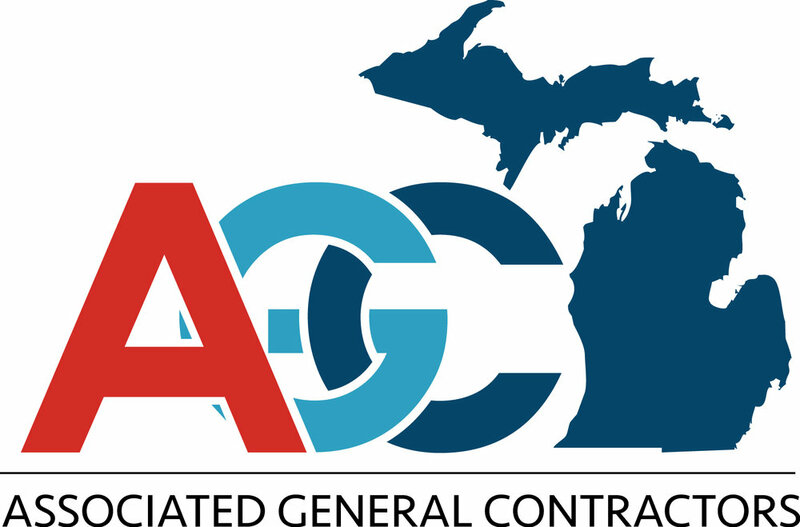 But in 2011, after almost 50 years of service, O’Brien Construction had substantially outgrown their rented office space in Pontiac, Michigan. 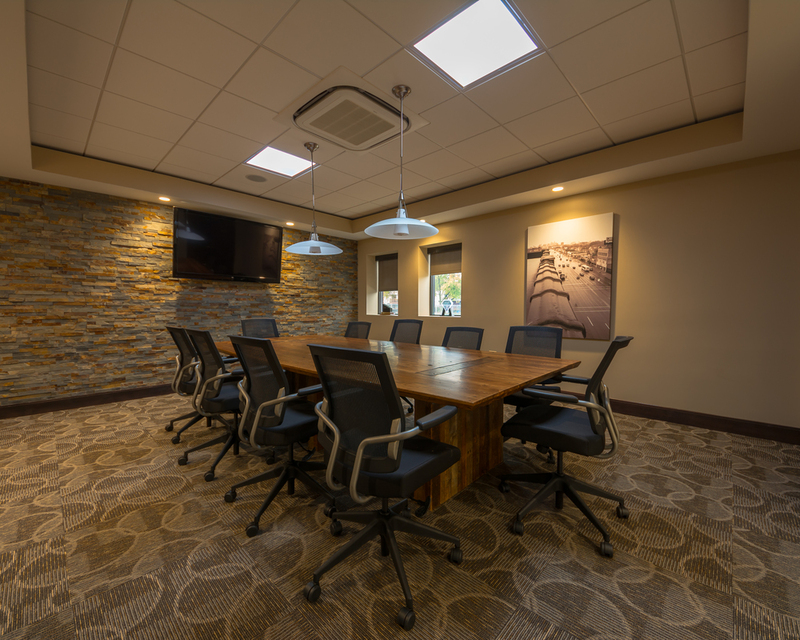 The firm’s growth and development necessitated a space where staff could work efficiently and subcontractor partners could be supported. Committed to their vision of enhancing the quality of the communities they serve, OCC sought to construct a headquarters that would be leave a minimal carbon footprint and be a model of energy efficiency for developers, owners, and the community alike. The scope of this project challenged O'Brien to investigate new solutions to traditional building systems and apply ingenuity to the adaptive reuse of a 1960’s office building. Designed as an industrial facility, the original structure contained a small front office annex with very low ceilings. This front portion was torn down and recycled while the shell of the existing cinderblock structure was gutted and reused. 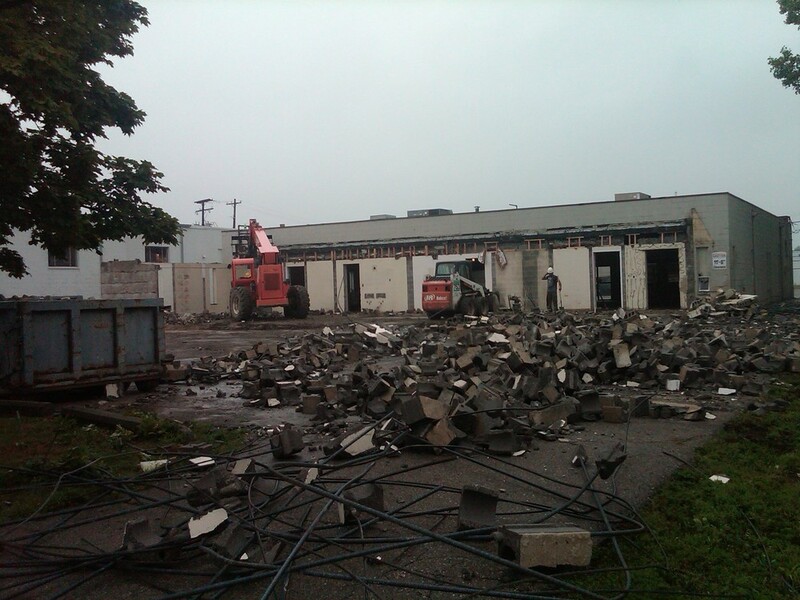 Additions were constructed at the front and back of the building to increase usable space. A new, freestanding two story garage was constructed at the rear of the property. Overhead electric service was relocated due to low clearance. 70% of the previously existing building was reused. O'Brien recycled 95% of all construction debris (by weight) including rooftop units, metal doors, lumber, drywall, ceiling materials, concrete, block and steel. Statistics of Success: Since moving into 966 Livernois, O’Brien Construction’s energy usage results are dramatic. Despite substantially increasing the size of its office space, the company’s energy costs have significantly decreased. Based on 2009 Department of Energy benchmarks, the 966 Livernois facility should utilize 840,000 BTUs of combined electric and gas service. In 2013, the building used 140,000 combined BTUs. These results are seven times better than the average building! Many leading edge green construction techniques were applied to the renovation and adaptive reuse of the 966 Livernois building in order to achieve these impressive results. Emerging Technology: The Variable Flow Refrigerant (VFR) technology utilized at 966 Livernois is very common to Asia and Europe, but is generally new to the United States. At the time of construction, the project was one of only three in Michigan known to utilize this advancement. Specialized engineering was required to design and construct this VFR Geothermal HVAC system. Drilling of the geothermal presented additional challenges as the drilling field penetrated an underground aquifer. Although O'Brien had experience with green building, including geothermal, the team had never accomplished an environmentally friendly project of this scale. The VFR technology used in the geothermal system is highly sophisticated. The team aggressively investigated and researched energy efficiency products and methods throughout the design and construction process. Designed for the Future: 966 Livernois was built with the future in mind. 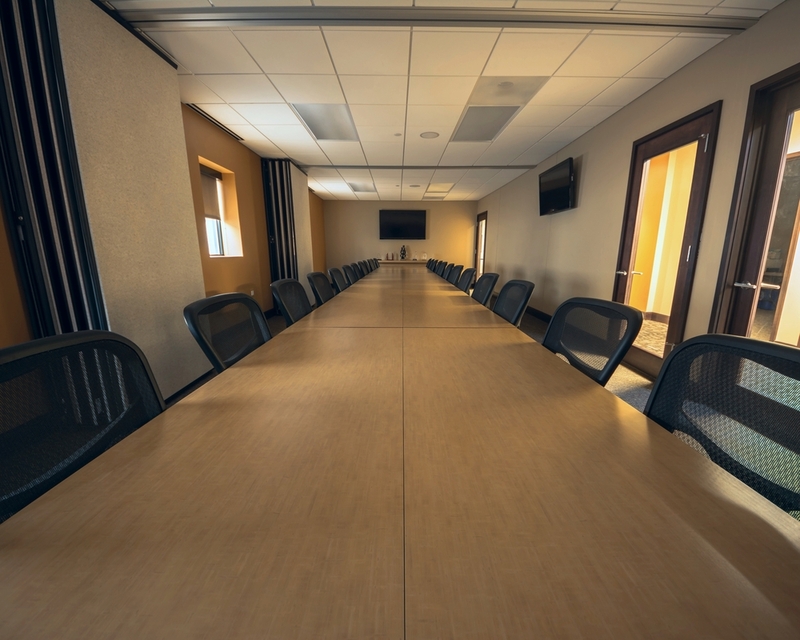 The finished facility can be easily adapted to meet tenant needs as the company evolves. In the event of expansion, the site can accommodate more staff by adding walls to prepared office spaces. Conversely, if the need for personnel decreases, the structure is designed to essentially be split down the middle creating private office spaces for two separate entities. Locations of HVAC, plumbing, electrical, and systems controls have all been integrated into this flexible layout. HVAC and Temperature Controls: The building’s heating and cooling system uses Daikon variable refrigerant volume fan coil units (VRV) and is one of only three of its kind in the State of Michigan. Utilizing twelve, 230’ deep vertical wells, the geothermal system transfers heat or cold in or out of ground, while energy recovery units (ERV) recycle warm or cool exhaust air and mix it with intake air for maximum efficiency. A make-up air unit is installed on rooftop to meet ASHRAE standards. A highly sophisticated, computerized control system communicates with itself to regulate the gradient temperature between zones in the building’s footprint. For example, if controls sense that the north side of the building is too cool while the south side is too warm, the digital system will automatically adjust to exchange the warm and cool air, creating a temperate environment throughout. The system always attempts to correct temperature variations by first redistributing indoor air before engaging geothermal heat pumps. Temperature automatically sets back during unoccupied hours of the work week, weekends, and holidays. Remote Building Temperature Monitoring is controlled via the internet. 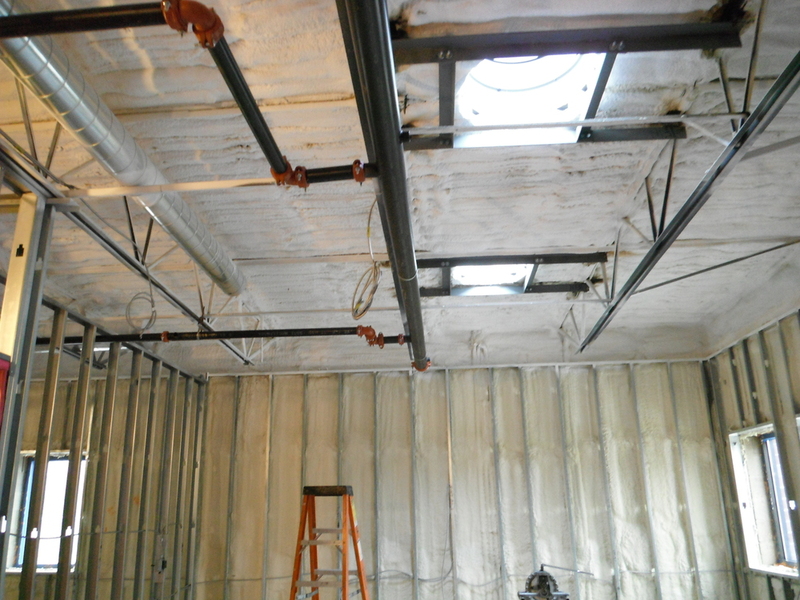 Insulation: The building’s envelope was encased in 2” rigid foam to prevent air infiltration. Horizontal 2” rigid foam insulation was installed on the foundation. Exterior wall assembly, rated at approximately R-30, includes 3 5/8” metal studs set inside a 2” closed-cell spray foam barrier to eliminate thermal migration. Remaining cavities in perimeter walls were filled with 3 5/8” sprayed-in cellulose insulation providing a 15% increase in R-value and a 10% increase in STC rating. Spray cellulose insulation was applied to all interior partition walls for sound mitigation. The underside of roof was insulated with 3” closed-cell spray foam. 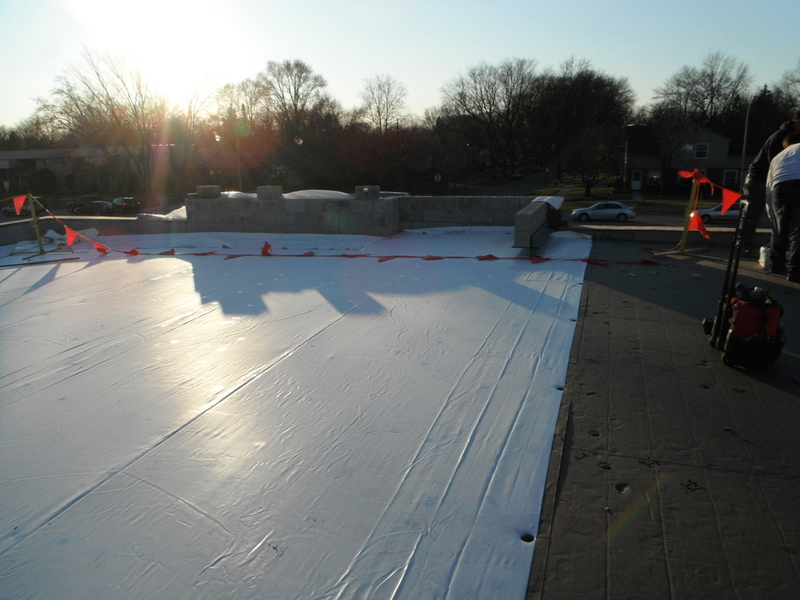 3” tapered insulation was installed atop existing built-up roof and metal deck additions. The R-value of roof insulation = 41. Windows: Existing single pane glass windows were replaced with new low-E, thermally broken aluminum storefront windows. New windows feature argon-filled double-pane insulated glass with a 1” air gap, giving them an R-value of approximately 4.9. A low percentage of window area was integrated to reduce heating and cooling yet still allow natural light. Tinting was applied for solar reflection. Frame & Roofing: O'Brien Construction reused the structure’s existing masonry shell and added interior metal stud walls. A highly efficient white Duro-Last roof membrane reflects 88% of the sun’s energy to provide significant energy cost savings. Plumbing: A dual use hot water tank with recirculating feature is utilized to temper fresh air in the building’s rooftop MUA (makeup air unit). This recirculating feature also affords hot water at point of use. Kohler plumbing fixtures are installed throughout the building including low volume, automatic flush toilets, low flow shower head, low flow automatic faucets and a high efficiency dishwasher. An Elkay drinking fountain with bottle filling station reduces dependency on plastic water bottles. As of January 2016, the station’s Green Ticker counter calculated that the device had helped O'Brien's office staff eliminate waste from 9,717 plastic bottles. Solar Technology: Nine solar light tubes provide natural lighting in hallways, main conference room, and exercise room. Controls allow light flow to be increased or decreased as needed. These solar tube skylights have proven themselves so effective that electrical lighting is rarely used within the building’s corridors. During construction, the building was prepared for solar voltaic array. These solar panels will convert the suns energy to electrical power. If the system generates more energy than is used, the building’s electric service provider will issue credits to the tenant’s account. 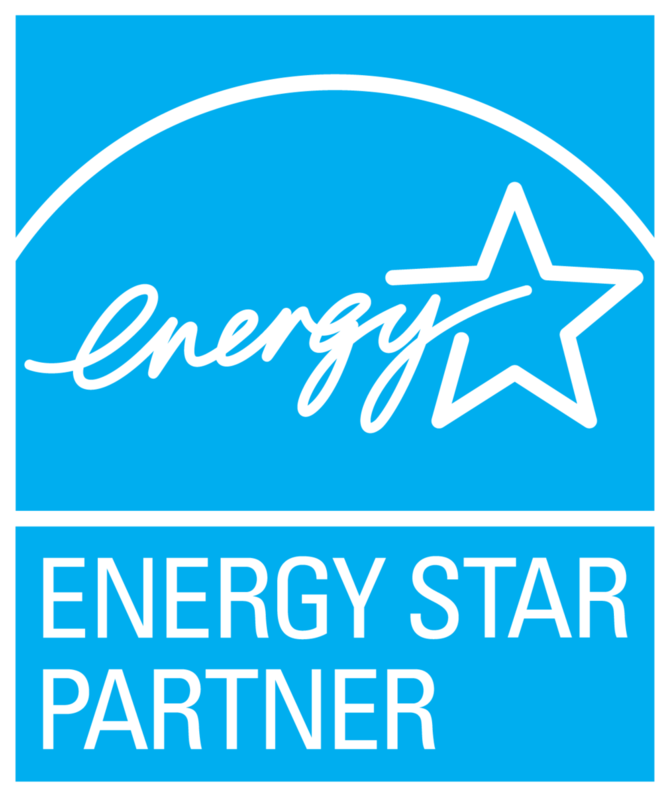 Electrical System & Lighting Controls: Energy Star rated lighting fixtures, with T8 florescent bulbs and LED luminaire technology, are used throughout the building. 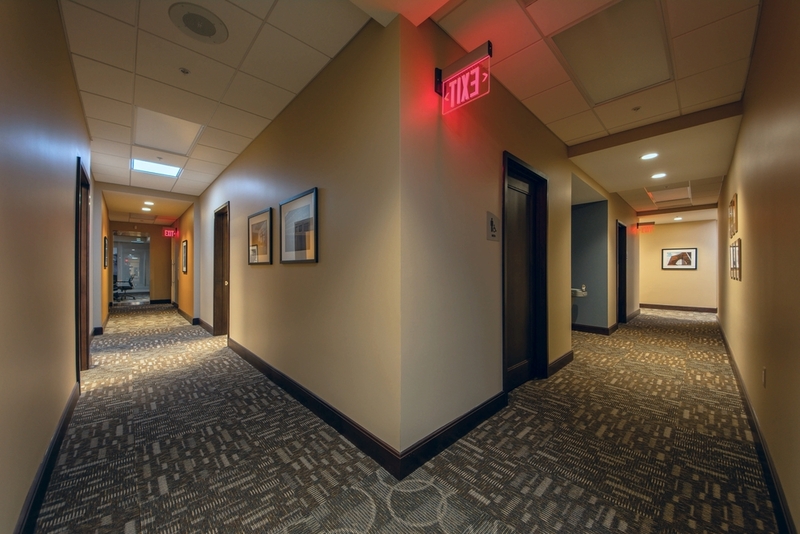 Occupancy sensors in all offices, common spaces, and bathrooms reduce energy load. LED lighting is utilized at exterior parking areas and garage. Downward facing lighting and lower illumination levels are used to avoid light pollution at the building’s exterior. Environmentally Friendly Materials: O'Brien used green building materials throughout the project. Carpet squares were made from post-consumer content and are 100% recyclable. All paints and sealants were low VOC. Asphalt, concrete, and cellulose insulation were all made from recycled content. 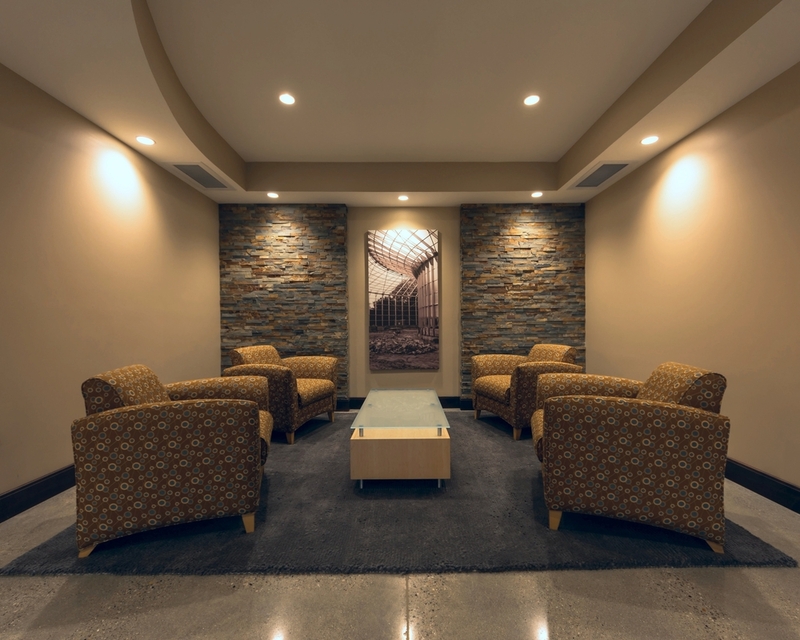 Environmentally friendly polished concrete was utilized in the building’s lobbies, bathrooms, kitchen, and other common spaces. 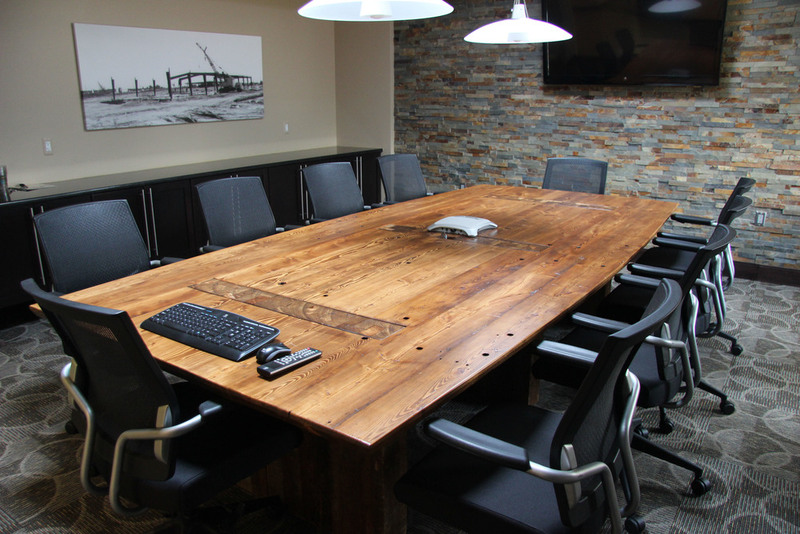 Deconstructed Wood Conference Table: The centerpiece of the Executive Conference Room at 966 Livernois is a substantial conference table made entirely of wood harvested from a deconstructed home in Hamtramck, Michigan. As part of Reclaim Detroit’s 2328 Carpenter House program, the table was part of 100 tons of debris diverted from landfills. Landscaping & Irrigation: A 500+ gallon underwater storage tank captures rainwater from the building’s rooftop and recycles it for irrigation of all landscaping. Native, drought resistant plantings are utilized throughout the property. Front parking areas sheet flow to a rain garden and swale to improve stormwater quality and reduce flow to storm sewer system. The building’s irrigation system is controlled by a Hunter Solar Sync sensor that calculates evapotranspiration (ET) and adjusts irrigation based on daily weather conditions. Through satellite technology, this computer controlled module eliminates water waste and reduces energy use. Transportation & Commuter Accommodations: An electric vehicle recharging station in the facility’s front parking area provides charging capacities for two vehicles at a time. One employee at the building utilizes the charger on a daily basis for his Chevy Volt. 966 Livernois is located within two blocks of public transportation or bus pick up location. Shower facilities and private changing area accommodate commuters who desire to bike or walk to work. Environmentally Responsible Practices: Every sheet of discarded paper in O’Brien’s office is shredded on site for recycling. Used ink cartridges are converted into eLumber which is used to build fences, landscaping applications and outdoor furniture. All office spaces are equipped with individual bins for sorting trash and recyclables.